Update: As deal emerges to end government shutdown, some companies continue helping workers. 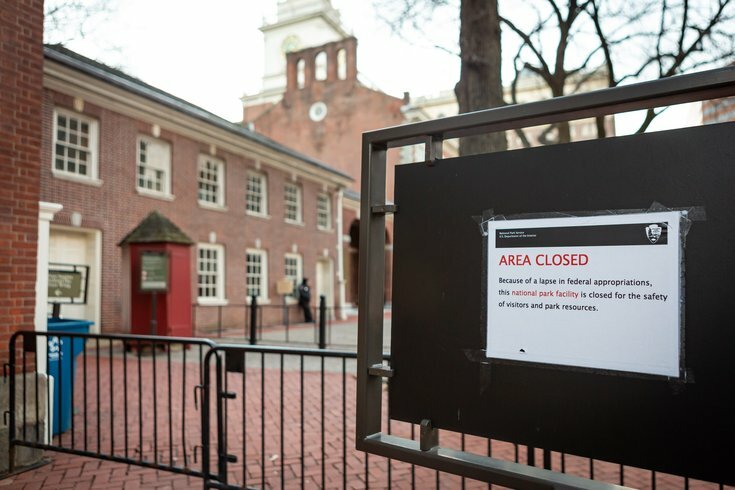 A sign in front of Independence Hall which is part of the Independence National Historical Park, Wed. Jan. 9, 2019. President Trump announced Friday afternoon a deal that would temporarily reopen the government, but the plan that would end the longest shutdown in U.S. history came too late to keep furloughed federal employees from missing a second paycheck. At this point it's unclear when the 800,000 federal employees, left unemployed during the dispute over Trump's demand for a $5 billion border wall, will see an actual paycheck. The deal includes backpay for the workers and time for negotiations between Democrats and Republicans over border security and immigration, but is set to end Feb. 15. PhillyVoice has been keeping a running list of companies and institutions that have stepped forward to help federal workers strapped for cash for more than a month now. We've updated the list, but suggest workers check with the retailers, restaurants and non-profits listed below to make sure the offer of help still stands. Shortly after Trump announced the deal, the Morris Animal Refuge, one of the oldest in the country, said it would continue to helped federal workers in need of pet supplies "while things get back to normal." For more information, federal workers struggling to look after their pets should contact Elisa Mellis, Director of Lifesaving, at 215-735-9570 or through email at emellis@morrisanimalrefuge.org. On Friday the national salad and grain bowl chain announced it will provide a complementary bowl to furloughed federal employees who present an ID over the weekend -- Saturday, the 26th, and Sunday, the 27th -- between the hours of 6 and 8 p.m. The dental schools at Temple and Penn are offering free dental care to furloughed government workers. Patients with urgent dental needs can be seen weekdays from 8 a.m. to 5 p.m. at Temple’s Kornberg School of Dentistry, 3223 N. Broad St. Appointments can be made by calling 215-707-2900. Walk-ins are accepted until 3 p.m.
Penn Dental Medicine is providing emergency dental care to furloughed federal employees on weekdays from 8 a.m to 5 p.m. at 240 S. 40th St.
Federal employees must bring identification to confirm their employment and contact information for their primary dentist, if they have one. Furloughed workers who do not have dental insurance are still welcome to receive care. Federal employees furloughed during the government shutdown can get primary care appointments within 24 hours with Cooper University Health Care, the South Jersey health system announced Tuesday. Bayou Bar & Grill, 4245 Main St. Bourbon Blue, 2 Rector St.
Cactus Cantina, 4243 Main St. Craft Manayunk, 4141 Main St. The Goat’s Beard, 4201 Main St.
Jakes & Cooper’s Wine Bar, 4365 Main St.
La Roca, 4161 Main St.
Lucky’s Last Chance, 4421 Main St.
Manayunk Brewing Company, 4120 Main St.
Ryan’s Pub, 4301 Main St.
Taqueria Feliz, 4410 Main St.
Tubby Robot Ice Cream Factory, 4369 Main St.
Winnie’s Manayunk, 4266 Main St.
All Federal Donuts locations in Philadelphia will offer federal government employees a free cup of coffee and a free doughnut once a day, everyday until the shutdown ends. Customers must show valid government ID. Rep. Dwight Evans teamed up with Philabundance, Share Food Program, and Nutritional Development Services to distribute food for free to furloughed government employees. Workers must bring their IDs, and their own boxes or bags, to Front & Tasker Streets under I-95 every Wednesday until reimbursement checks are distributed. Until the shutdown ends, these museums are offering free admission to federal workers. The pizzeria is offering one free pie to all government employees and one discounted ($5) pie to all government contractors between 3 and 5 p.m. daily. Must show valid ID. The restaurant is offering 20-percent off for federal workers who dine-in. Children in the immediate family are no charge. Until the government re-opens, Brickwall Tavern is offering federal workers with a valid ID a percentage off of their food bill. The longer the shutdown, the greater the give back. On Day 28, the percentage off is 28-percent. It will increase by 1-percent each day. Brickwall Tavern has a location in Philly and two in New Jersey. The Old City restaurant is offering a free bowl of the new lobster pho ($22) to all federal employees affected by the shutdown. The 24 oz. bowl include house-made broth, chunks of Maine lobster (including the tail and the claw), rice noodles, bean sprouts, purple basil, cilantro and sliced jalapeños. The Greater Philadelphia YMCA is deferring the February membership dues at its 17 locations for impacted government employees and their families. Moreover, the Y is offering a free gym membership for that month to government workers and families who are not members. To qualify, Y members need only present a federal employee ID and the deferral will cover the entire month of February, regardless of when the shutdown ends. “We are committed to connecting people to healthier lives," said Shaun Elliott, president and CEO of the Greater Philadelphia YMCA. "We know the combination of exercise and the sense of community they will find at the Y, can alleviate some of the stress these federal employees are feeling. We hope that this will undo some of the financial pressure on our current members. But we also invite any federal workers, affected by this shutdown, to take this opportunity to experience the support we offer our communities every day. The health system giant is providing free produce to federal employees through its Mobile Farmers Market program as it launches a canned food drive for government workers among its 9,000 employees. The Virtua Mobile Farmers Market will provide a free bag of produce each week of the shutdown to federal government employees with a current government ID. Employees can find times and locations for the mobile market here. According to Virtua, the emergency food drive – set to last until Friday, January 25 – will pass along donated items to the Food Bank of South Jersey. Virtua is asking employees to drop off canned vegetables and cans of fruit, tuna and chicken at its corporate headquarters in Marlton and other Virtua locations. It is encouraging the public to donate to the Food Bank directly. “As the Ambassadors of Goodwill, we want to show our support to all those government workers whose paychecks, and by extension their families, are directly impacted,” said Globetrotters President Howard Smith. The popular neighborhood food cooperative in Mt. Airy, Chestnut Hill, Ambler and elsewhere is offering zero-interest credit for purchases to members who are federal employees who have been furloughed. "As the partial government shutdown drags on, the Co-op is committed to assisting those directly impacted by it," said Weaver's Way directors announced. If you're a member and a government employee, contact the Membership Department via email at member@weaversway.coop or by calling 215-843-2350, ext. 118, for more information. Also offering food on credit is the Trolley Car restaurant chain, which announced that "we'll take down your information and look for payment when this crisis is over and you receive back pay." "We were hoping to avoid this offer of credit but after 27 days of shutdown we cannot continue to sit on the sidelines," said Ken Weinstein of the Trolley Car Diner in Mt. Airy, Trolley Car Cafe in East Falls and Trolley Car Station in University City. "The nearly 800,000 federal government employees who are not being paid their salary during the government shutdown need our help and support if they are going to make it through this crisis. Providing a good meal for them and their families is a small step toward making their lives comfortable but it is a step worth taking." A local restaurateur is offering a free fried chicken meal. "When we saw the news that federal employees wouldn’t be receiving their paychecks today, we decided that we had to take action to help the local park rangers, postal employees, TSA officers and other U.S. government personnel who need help making ends meet during this crisis," said Drew Abruzzese, whose Pineville Tavern and Pineville Fishtown restaurants are offering a free dine-in deal.